Here is another great crock pot recipe that you could throw on first thing in the morning and would be ready for lunch or throw on around lunch and have it ready by dinner! I saw this recipe and my mouth started watering! This was absolutely amazing! Even my 2 year old gobbled it up! If your looking for an easy and yummy meal, this one is absolutely PERFECT! an easy, fast and delicious meal that you will want to make again and again! Place chicken in a 3-4 quart slow cooker with 1-2 cups of water, cover and cook on low heat for 4-6 hours. Place chicken back in the cooker and pour dressing, Parmesan cheese, parsley, and pepper over the top. Stir until mixed evenly. Cover and cook on high heat for 30 minutes or until mixture is hot. Spoon ¼ cup mixture onto each slider bun if you are making sliders or more for regular sized buns. Top with extra shredded Parmesan cheese and lettuce to serve. Yummy, sounds so easy for the busy spring time with 2 kids playing basebell/softball and me being on a softball team as well. Thanks for sharing this simple and easy recipe. Love this idea, and that it uses an oil-based dressing vs. creamy! This sounds delicious and simple! Do you think the cooking time and outcome would be the same if i used chicken breasts, rather than thighs? I have seen these around, but have yet to make them. I love using my crockpot for shredded chicken! Made this tonight for dinner and it was wonderful! I prepared everything on the stove top since I decided "last minute" to make this...and it was a breeze. Served the sandwiches along with potato salad (red potatoes and chipotle mayo), and it was a perfect Springtime meal! If you have a Stand Mixer, you can put the cooked chicken in it with the metal attatchement and it will shred the chicken perfectly in no time. This sounds delicious, and I'm going to try it and more of your slow cooker recipes. With summer upon us I plan to use this method of cooking often.Thanks for the great ideas.M. The Girl Who Ate Everything site recommended using Brianna's or Cardini's and to use creamy. I added garlic and bacon. Delicious...left overs are also great. I put on a wrap with lots of chopped lettuce and spring mix and then drizzled dressing over the top. Next time I will try with Cardini's Lite dressing. The Girl Who Ate Everything site said this: The chicken thighs fall apart in the crockpot and are so much more tender than chicken breasts (although you could use those too). Sorry about the late response, I added it to the recipe. I actually use Chicken breasts, just out of preference, when I make these and it tastes amazing! Made this recipe tonight and it was a huge hit. The chicken was so tender and the parsley added a freshness combined with the romaine. Good easy meal. About how many chicken breasts do you use to equal 2 lbs? I tried this for dinner tonight just as a chicken-lettuce wrap and it was delicious! Made this tonight as wraps... HUGE hit! These are AWESOME! I made it with thighs and the chicken just fell apart. So easy, so tasty. Have made these 3-4 times and I tell you they are *delicious* - our company raved about them! This will be a new family staple, THANK YOU for sharing!!! these sound AWESOME! and so easy. my boyfriend will love them - thank you! These are DELICIOUS! I've made them three times since May and I know they'll be one the "busy menu" list this summer. Thank you so much for sharing--glad I saw this on Pinterest. This is fantastic! Thanks so much! The whole family ate several meals off this, even my picky 9 year old. She likes the chicken wrapped in the lettuce like a little taco/wrap. Just made this tonight & it is so good!!! My 2 year old, who only eats apples, even ate it! Thank you so much for this new favorite! These are very good! Also, if time is a concern, purchasing a rotissiere chicken and shredding it would work just as well. We added tomato to our sandwiches too. Thanks for an easy and delicious recipe! Do you think this would work with Ranch dressing? This looks very yummy and I really want to try it, especially as a wrap. My only question is do you think it would work with homemade caesar dressing? I try hard to avoid bottled dressings due to food sensitivities but I do want to make it. Also is it just as good when the chicken is cold and is eaten as leftovers? Are the chicken breasts frozen before putting them in the crockpot? Or do they have to be thawed? Thanks. 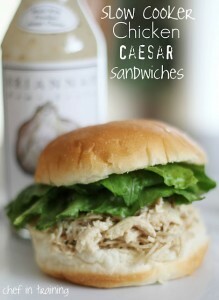 Made these sandwiches for dinner tonight using the Kraft classic Caesar dressing. All I have to say is, thank goodness I doubled this recipe because it is absolutely delicious! Sounds yummy, Guess what we're having for dinner tonight! I definitely think these would be great cold on a hot summer day! Wow! I made these tonight & they were awesome! I have to admit, I worried how this would turn out. I've read some bad stuff about chicken cooked in a crock-pot. I'm relatively new to cooking, so I wasn't sure, but I'm glad I took the chance! I used 3 bouillon cubes dissolved in 3 cups of water instead of just water. I also added a little more parmesan cheese, but followed the recipe other than that. I love the way the chicken cooked & already have big plans for more chicken cooked this way! :) I couldn't believe how much the dressing seasoned the chicken... No extra salt or pepper needed! Great recipe, thanks for sharing!! This is delicious. This is mt third time making it and its fabulous every time! Thanks for sharing! This is so good! I've made it three times now and it turns out great every time! The first time I didn't have any parsley (fresh or died), and it was good, but DO NOT leave out the parsley! It gives it a great, fresh taste! Thanks for the great recipe-I've given it to at least 5 other people! I have made this recipe 5-6 times and I'm making it again tonight. It's always my go to if I don't feel like spending a lot of time in the kitchen. It's flavorful, delicious, quick and easy! And as if I need to say more: my husband requests it at least once a week. Thanks for a great recipe that has become a staple in our rotation. My family has declared this the best new sandwich recipe I've tried this year, and I test a lot of recipes! I'm going to post this on my site with a link back to you! Made it for the second time tonight! My boyfriend who has a child's palette and me, a foodie LOVE this EASY meal. Moist and flavorful. I ate mine on a bed of butter leaf lettuce to hold back on carbs in evening! Delicious! This looks amazing! Could I cook the chicken on high for less time? Oh yum! Definitely going to try this!! Thank you for this wonderful recipe! It's the number one request now when we are having guests, or a party! It's so easy and amazing- it tastes like it takes a whole day to prepare. If I wanted to use just ONE pound of chicken (since there's only two of us), would I cut the cook time at all? and do you suggest I still use the same measurements for everything else or cut them? I made for dinner tonight ... I only used 1 lb. chicken breasts ((makes a lot!). I did add extra dressing (about 12 oz. - used Marzetti Caesar Dressing) - it was really good! Do you by chance know nutritional content? Mainly carbs/fiber/protein of the recipe (not counting any bread or toppings). This was delicious! Even better each time I warmed up the leftovers for lunch each day for a week. Thanks for sharing! Only tip I have is to make sure to use "freshly ground peppercorn" - really enhances the flavors. Are these good cold? I am looking for lunch ideas for school kids. Thank you- this looks wonderful!